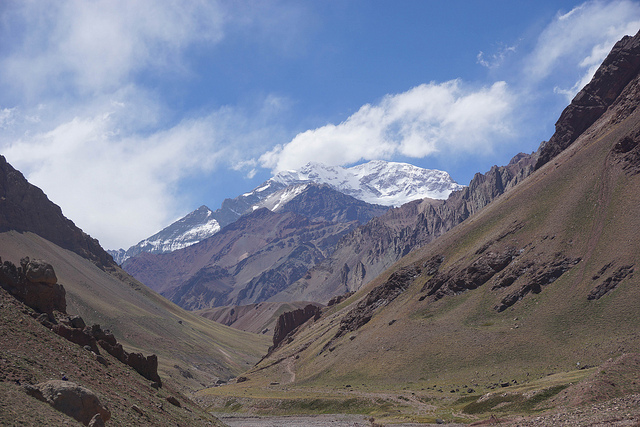 I recently just finished cleaning up and culling my Aconcagua photos. See them here. I didn’t realize until I got home that my camera’s sensor had somehow gotten a couple of specks of dust on it, so pretty much every single photo with sky in it had to be repaired. Luckily, Adobe Lightroom makes that pretty easy — but still tedious if you have to clean up 150+ photos! I actually slept really well last night as we are finally in temperatures that it was made for (it is rated down to -30F). The weather has not been the greatest. Cold, windy, and overcast. The clouds really are the biggest downer for me. Today was much like yesterday: slog from a lower camp to a higher camp, pitch tents, hydrate, eat, rest. Good news came in the evening with the weather report! It looks like our original summit day, the 14th, has opened up! What a huge relief. Not only does it mean we will have an actual shot at the summit (before it was in doubt), but it also means we won’t have to spend an extra night on the mountain. When Ilan came to our tent with the update I nearly cried. I think it was the altitude. Anyway, I was amped the rest of the night. Not much to say today. We moved up to the first high camp, Canada, at 5030m. Even with a heavier pack, the climb wasn’t that difficult. Upon arriving we immediately pitched the tents and hydrated. Our guide, Ilan, made us hamburgers as a treat for dinner. They really hit the spot. Camp Canada is pretty exposed so we stayed in our tents the majority of the time. It is like having a 7:30 bed time. I’m getting lots of reading done. Tomorrow we move up to Camp 2, Nido de Condores which is at 5600m. Today we did our one and only carry to the first high camp. A carry is when you haul gear you need higher up but don’t need at base camp. We also took up all of the food we will need for our summit attempt. After dropping the gear off at the high camp, you then go back down to the lower camp to sleep. Today however after dropping off our gear at Camp 1 we went up to Camp 2 to further acclimatize ourselves. The weather was great with some wind but mostly sunny. Camp 2 is at 5500m. As we were approaching it, I realized that physically I could beat this mountain. I felt great, I had no problems with the altitudes, I had the energy. That was a very important mental milestone for me. The training hikes I has been doing for so long had prepared me so well for this that I would say it is easy. I was overjoyed to get to Camp 2 with such ease. Of course things can change over the next 500m to Camp 3 or the 1500 or so meters to the summit, so I’m not trying to be too cocky. The descent was rapid as we could skree ski almost the whole way down. What took us about 6 hours to go up we went down in just over an hour. It was a long and exhausting hike, but very fulfilling. Tonight at dinner one of our group informed us he would not be going up with us. He had a family emergency and needed to head back to Norway as quickly as possible. Another downer was the weather report. Our scheduled summit day, the 14th, was almost certainly not going to happen due to high winds. We have two options: skip a high camp and summit a day early or wait until the winds go down. Most of us were strongly for a summit attempt on the 13th, but a couple of others were struggling with the altitude and weren’t that interested in speeding things up. We will make our final decision later as weather changes quickly.